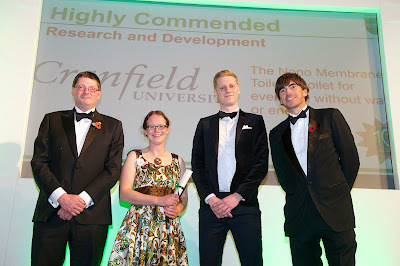 We were delighted to be Highly Commended in the Research and Development category at the 2014 EAUC Green Gown Awards. Alison and Ross attended the awards ceremony at Manchester University and were treated to a delicious organic dinner before being presented the award by TV personality Simon Reeve and a representative from category sponsors, ARMA. Alison and Ross with the Simon Reeve and a representative of ARMA. The judges said, "This is a strong project that has the potential to provide sanitation to people who do not currently have a toilet - 2 billion people around the world." Our Vice Chancellor, Professor Sir Peter Gregson added, "The Nano Membrane Toilet project exemplifies the innovative, transformational and multidisciplinary research for which Cranfield is renowned. 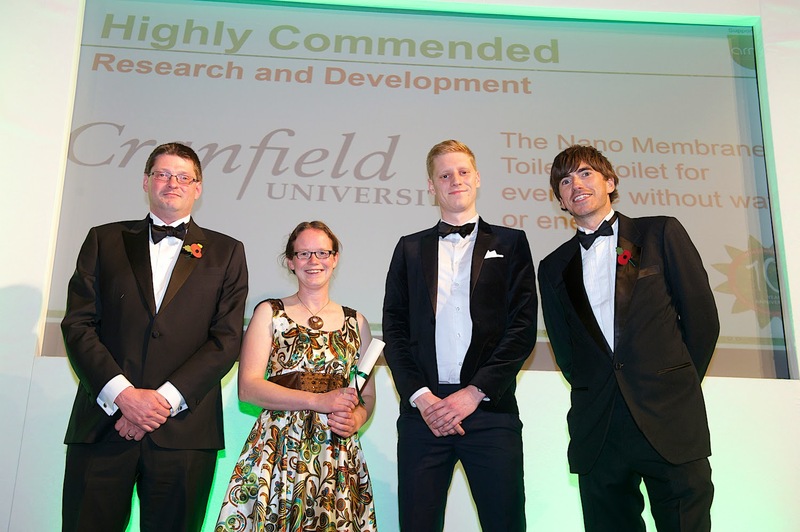 Winning this Award enhances awareness of Cranfield’s international research capabilities in water and sanitation, and provides much-deserved recognition for the hard work and dedication of all the project team." The winners' brochure containing details of all the prizewinners can be downloaded here.